Thoughts on Amazon, e-books, and the future of how we read words. The year I graduated high school, the media was overrun with speculation about a new technology set to shake the foundation of the world. What was it? We weren't told, exactly. All we knew was that code name "IT" was so revolutionary that we would have to rebuild our cities from scratch. Techie god Steve Jobs declared it "as big a deal as the PC." At the end of the year, the product that was about to blow our minds to the future was revealed: the Segway. Instead of forcing us to rebuild our major metropolises, the Segway managed to be a prop for blowhards on TV sitcoms. I think I've seen one twice in real life. I was thinking about the Segway again as I've fallen into a hole of reading about Amazon versus Hachette, e-books, self-publishing, and Kindle Unlimited. Most articles and nearly every comment thread are filled with declarations that e-book dominance is already here. The publishers are "dinosaurs" who don't see the "paradigm-shifting" "sea change" and aren't creating "proactive" new "business models" in the wake of this "disruptive" "revolution." Anyone who reads print is a "luddite" propping up a "dying industry." If they don't get on board soon, they're doomed! Strangely, you can read those same comments in articles from last year. Or five years ago. Or 10. It's been over 15 years since the first dedicated e-readers were released, and over seven since the first Kindle. Today, about 15% of consumer spending on books is electronic and about 30% of books sold are e-books. The majority of book readers still only read in print, and only 6% of readers read e-books exclusively. It's clear that e-books are here to stay, but it's less clear that the complete dismantling of the publishing industry is around the corner. I'm the online editor for Electric Literature, an organization dedicated to new literary models and technologies. I'm active on social media, I've crowdfunded a book, and I've published e-only works. I'm hardly a luddite who hates the internet, and indeed I get excited about the new possibilities for reading and literature out there. Still, I roll my eyes at the constant declarations that the future is here all over again. Every new product is a revolution, every app will completely change how we communicate. A pair of "smart boxers" that monitors your farts per day is the future of underwear. An e-toothpick that tweets your gum health is a paradigm shift in dentistry. It's true that there are always people who resist change, and industries that collapse because of it. It is also true that new "revolutions" fail to occur on a monthly basis. Even the most forward-thinking writers get their predications way off. Technological progression always looks like a straight line in retrospect, but only because we ignore the supposed sea changes that fail. Movies were black and white without sound, then black and white with sound, then color with sound. But what happened to Smell-O-Vision? And five years after Avatar, why hasn't 3D completely taken over the way we watch movies instead of being a declining sideshow? On the one hand, it's easy to see the progress from early cell phones to modern smartphones. And yet, the fact that it was phones that progressed that quickly instead of, say, consumer vehicles (still no flying cars?) would shock time travelers from as recently as 1994. The Future of Books Is Hypertext! No. It's POD! No. It's Enhanced E-Books! Apps! Netflix for Books! None of Those? Wait. It's Cloud Storage! In Bloomberg, Leonid Bershidsky recently declared that the Amazon-Hachette dispute is silly because both companies "fail to recognize is that in the world of digital literature, book ownership will soon be an anachronism." The actual future of books, according to Bershidsky, is "an enormous digital library in the cloud, where any book could be borrowed." I could see a cloud service working, but it's another amusingly confident prediction that contradicts previous confident predictions. Is the future cloud borrowing instead of Netflix model? Is it "an interactive novel read on a Google Glass"? Is it apps? Social writing networks like Wattpad? Print on demand (POD) machines on every corner? Nano-narrative book bots plugged directly into your eyeball? Likely all of those things will have some role, however small, in 10 years' time. But one thing that all of these predictions miss is that people actually like physical books. They like holding them. They like putting them on bookshelves and coffee tables. Hotels and retail stores buy bulk used books for decoration. Many people who buy exclusively e-books still like to browse in physical bookstores and look at physical books. The printed book is far from dead. [...] the book market is following the music market's technological development path. It progressed from hardcover and paperback books — analogous to vinyl LPs and CDs — to Amazon's Kindle, which could be used to purchase books from Amazon the way Apple Inc. sold songs to iPod users through its iTunes store. 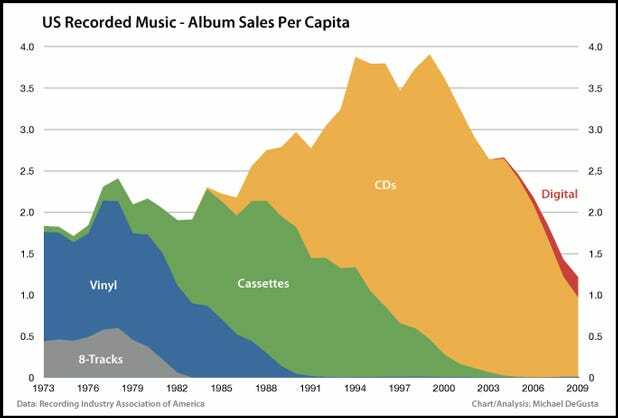 * In seven years after the iPod was released, the CD market was dead. Seven years after the Kindle, e-books are somewhere between 15 and 30% of the market, depending on how you measure, and their growth rate has nearly flatlined. * New music formats were improvements while new print formats were variety. New music formats had more functions (fast-forwarding, skipping around, etc. ), were smaller, and held larger amounts of information. Trade paperbacks were cheaper, less sturdy version of hardcovers, and mass market paperbacks were cheaper and flimsier still. Book formats were meant to capture different parts of the market; music formats were meant to replace previous formats. * In a 20-year period, consumers were asked to move from vinyl to cassette tapes to CDs to MP3s —and to buy new devices to play them with each time. You read paperback and hardcover with the same set of hands and eyes. * While MP3s and iPods were immediately embraced by the youth of the late '90s and early '00s (myself included), e-books are actually more popular among Gen Xers and baby boomers than twentysomethings. * There are numerous industry differences too, but in the interest of keeping this relatively short I'll stick to one: the music industry was built around using singles to sell albums. Customers often felt forced into paying full album price just to access the one or two songs they wanted. Readers, however, do not buy novels to read the one chapter they like over and over. Even if you believe that the publishing industry is just another bunch of "dinosaurs" like the music and movie industries, it doesn't follow that the big publishers are dying. Last time I checked, the rise of Netflix and YouTube haven't stopped the box office from being dominated by the same movie studios rebooting the same franchises with the same famous actors. While a few superstars have risen from self-publishing, it still remains the usual pack of Big 5 Kings and Rowlings topping the best-seller lists. As a fan of independent music, small presses, and weirdo films, I'm not cheering this on. I wish that the early '00s vision of the internet allowing the passionate indies to topple the giant corporations had panned out. At best, though, we've traded a handful of old corporations for new, larger ones (Amazon, Apple, Google, etc.) and actually made it harder for artists to survive. The dinosaurs, it would seem, are much better at adapting than we think. The Future of Books Tomorrow...Today! Since I've taken some jabs at other people's overconfident predictions, here's where I post my own predictions for future bloggers to mock. It's possible that in the distant future we will "read" by injecting word venom into our bloodstream, but I don't think printed books are going away anytime soon. (Predictions beyond a decade are pretty pointless in conversations about contract negotiations or what way to publish your work today.) E-books will continue to grow, but print will remain a large portion and probably capture a majority of dollars spent for the near future. If there's a reason to be bearish on print, it's the shuttering of physical bookstores (although indie bookstores are experiencing a bit of a comeback). If there is any reason to be bearish on e-books, it is that dedicated e-readers are already nearly obsolete. The reason that neither e-books nor print will die is that both have separate advantages. Print books are easier to flip through, easier to write in, look nicer on your shelf, and — as recent studies have indicated — the human brain processes information on them better. (That's before getting into questions of DRM, poor formatting, the inability to loan or resell your e-books, and so on.) E-books obviously have advantages too. You can bring one slim device on a long trip instead of a half-dozen books. If you are connected to the internet, you can purchase instantly, look up words, and share bits with friends. Etc. The film industry seems like a good comparison in how the mediums don't compete as much as capture different markets. Diehard fans go to the theater and buy Blu-rays, regular fans go to theater now and then and maybe rent from iTunes, and casual fans just watch whatever happens to come to Netflix or Redbox. It's easy to imagine diehard readers buying special editions or hardcovers, while regular readers get the paperback or e-book, and readers who don't care as much about specific authors will buy whatever e-books go on sale. And what about these "Netflix for books" services? People have been predicting their ascendance for some time, but I'm still skeptical. A big part of how Netflix works is by having a ton of crappy films and shows that casual viewers would never pay movie ticket prices for but will watch for no additional charge. My guess is that there are fewer readers like that, and people who do read that way can fill that need with extremely cheap used books or self-published e-books (thousands of which can be gotten for between $0.00 and $2.99). Unless these services figure out how to offer something new — exclusive content à la Netflix? — they won't be a major force. The ease of e-book publication combined opens up a lot of possibility for companies and organizations to become their own publishers. We have already seen magazines and newspapers start to publish e-books. Not only will this trend increase, but it will expand to other areas. TV shows and movie franchises publishing additional e-book material for diehard fans perhaps? What about self-publishing versus print generally? I tend to think that framing them as opposing forces obscures the fact that they are, to a large degree, different worlds. Self-publishing has opened up new markets — some that big publishers overlooked, some that they didn't want to be involved in — more than it has eaten away at traditional publishing sales. (If Amazon succeeds in drastically lowering e-book prices, the reverse may happen though.) Rather than self-publishing or traditional publishing, authors in genres like romance, fantasy, and sci-fi will increasingly go "hybrid." Despite the regular hyping of enhanced e-books/hypertext/apps/interactive books, I don't see those going anywhere outside of a few specific markets like children's books and textbooks. The problem is that we already have a whole industry devoted to interactive narratives: video games. Art forms survive by figuring out what makes them unique, not by trying to emulate other mediums. Currently, publishers just convert their paperback books to e-book and self-publishers POD the same books they sell digitally. Just as art forms need to push their unique advantages, I think the future of books is pushing the unique advantages of different formats. In print, you will see more focus on design. In the last few years, we've seen an increase in special editions, beautifully designed and smartly curated series, and books that really have to be read on paper due to unique layouts or interior art. And what about using POD technology to allow customers to create their own anthologies from a publisher's catalog? Publishers need to find ways to use the different advantages of each type of book, and figure out what kind of work can be done on e-book but not print, or POD but not hardcover. You will also, I think, increasingly see e-books used to supplement the print edition. From J.K. Rowling writing new Harry Potter stories on her Pottermore website to Adele Waldman writing an e-single story from the POV of a minor character in her novel, writers are starting to figure out how to use digital distribution to provide additional material to readers. In short, the various formats will cohabitate peacefully…at least until the next dinosaur-killing, paradigm-shifting, sea-changing, revolutionary technology appears. Lincoln Michel's fiction appears in Tin House, Electric Literature, Unstuck, NOON, and elsewhere. He is a co-editor of Gigantic magazine and Gigantic Worlds, a forthcoming anthology of science flash fiction. Sometimes he draws authors as monsters. He tweets at @thelincoln.